Paul VI Catholic School art teacher Mrs. Jean Wheeler Bordner teaches a high level art class that encompasses three levels and a vast amount of talent. Students work independently in the same class. For instance, Katie Wheeler ’17 is in Mrs. Bordner’s Honors IV Portfolio class. Chris Kleha ’18 also is in Mrs. Bordner’s Honors IV class. Next year, he’s enrolling in Advanced Placement Drawing, so he’s begun his portfolio this semester and has focused on shoes of particular people that relate to their lives. 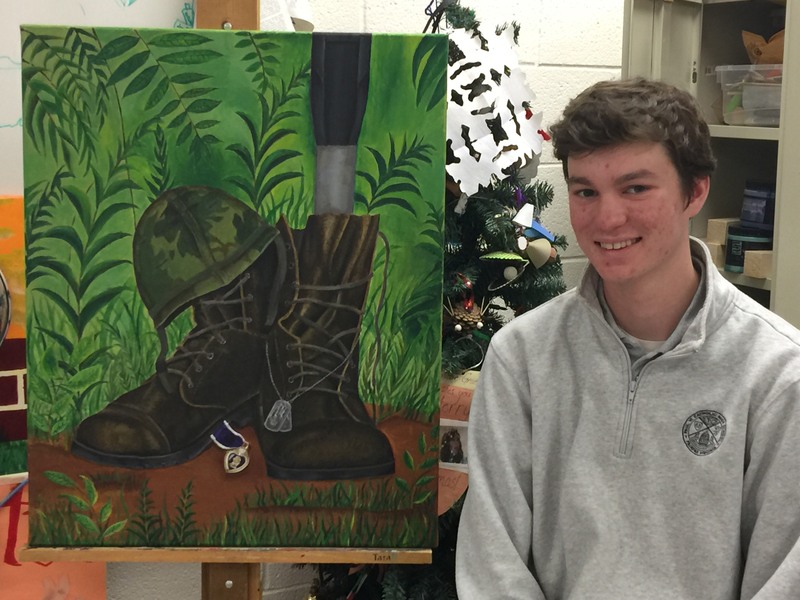 Kleha’s “Vietnam Veteran” acrylic piece is inspired by his Uncle Hank, who lost his leg in Vietnam. The painting has been picked up by Celebrating Art in Logan, Utah, for its Celebrating Art Spring 2017 edition, which ships in September. Currently, Kleha is working on a three-dimensional piece with an airbrushed background, painting, and tops of shoes, which has yet to be named. Kleha has been interested in art ever since he could use a pencil. “I was always drawing something when I was little.” When he was in seventh and eighth grade, he won his school’s yearbook cover competition. After middle school, he put together a portfolio, and by the time he came to Paul VI, he was able to skip Intro to Art and enroll in Studio Art 1. Some of Chris’s Custom Kicks. “In my sophomore year at PVI, I was part of the basketball team, which led me to getting involved with basketball shoes and sneakers,” he recalled. He combined sneakers and art, and began customizing shoes for people. 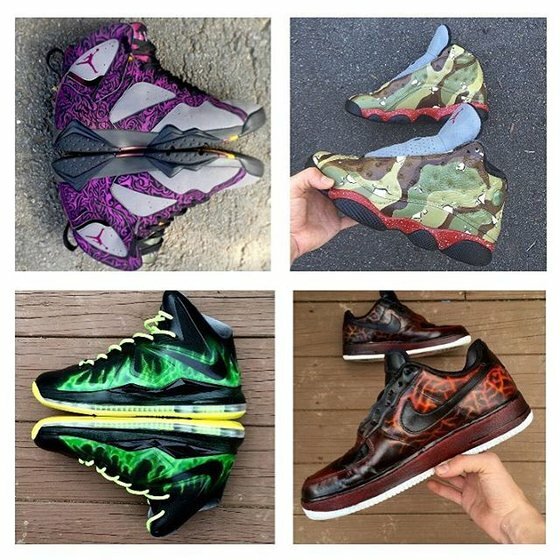 Then, he turned the hobby into business, deciding to make money by custom painting sneakers for fellow students and online through his website, Chris’s Custom Kicks. He uses paint formulated for leather. This past winter, he offered to customize a pair of sneakers as an auction item for the PVI Auction and Benefit Dinner. Kathleen Caulfield ‘17 is in Mrs. Bordner’s Honors IV class and is working on designing a fashion garment. Her inspiration is Frederick Bazille, an artist she viewed during the class’ recent field trip to the National Gallery of Art. She is illustrating a fashion design based on artist’s style. 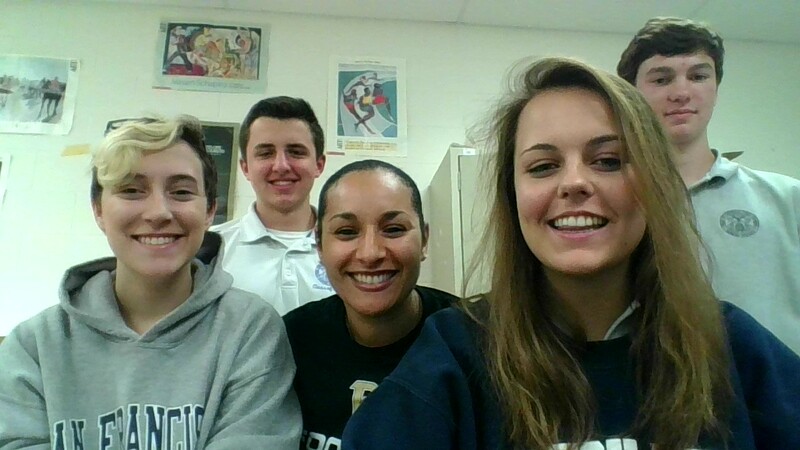 Lucas Tauscher ‘17 is in Mrs. Bordner’s Honors III class. “Mrs. Bordner gives me a packet, and I work from there.” Tauscher is currently working on art styles done creatively for which he has partitioned his paper into six different areas. “You do a different style of art with the same theme,” says Tauscher. He is focusing on molecules in six different art styles; the sixth is in his own style. Keith Haring, Pablo Picasso, Piet Mondrian, Andy Warhol, Georges Seurat are his inspiration for the other five sections.